In the aftermath of devastating floods in Newcastle, Australia, many children in the area showed signs of low self-esteem and disconnectedness, according to youth worker Lisa Dyer. Inspired by a program used following massive bushfires, Dyer began doing equine therapy with these young people to help them heal emotional wounds. The dramatic upheaval caused by such natural disasters, like those recently striking Texas, Florida and Mexico, has a heavy long-term impact on young people. Often trauma takes time to surface, explains Dyer in an ABC News article. Working with horses is one way to engage these children while presenting them with life skills they can implement in that moment. "On the children's first visit the farm," shares Dyer, "we talk about the roles and responsibilities in different herds in our lives, like our families, at school, in the playground, and the children each identify with an animal that they connect with — like the orphan, the rehabilitated horse, the old horse or the bully." 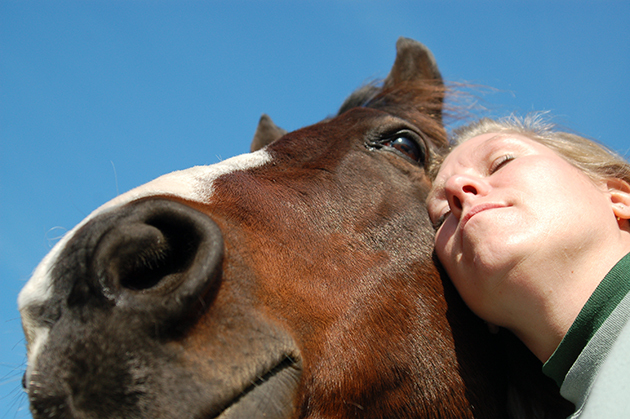 Therapy that includes horses has been gaining popularity over the past three decades. Along with being a recognized therapy approach for people with physical disabilities, it has broad-reaching potential for supporting children with emotional and mental health issues. Some school districts in the United States have even adopted equine therapy in their programs for at-risk youth. Regular interaction with horses is not new to schools. Horseback riding was already a weekly activity in my older brother's educable mentally handicapped (EMH) program by the early 1970s through the North American Riding for the Handicapped Association, formed in 1969. Today, more than 42,000 children and adults with physical, mental and emotional challenges are served each year by the association, which evolved into the Professional Association of Therapeutic Horsemanship International (PATH) in 2011. Not all equine therapies involve riding. Some only happen on the ground, as with the internationally-recognized EAGALA (Equine Assisted Growth and Learning Association) method. This allows the horse to behave more naturally and be on equal footing with human participants, according to the official association website. This method has been employed by school districts such as Monterey Peninsula Unified in California to promote social and emotional skills, goal-setting, conflict resolution, ability to self-regulate as well as to improve school attendance. The focus is on students who are at risk of dropping out, have history with the juvenile corrections system and those who simply find adjusting to the classroom setting difficult. In a poignant interview, the assistant superintendent in charge of the district's alternative education department for at-risk youth shared a unique situation where he had the horses brought to a high school campus after a classmate was killed in a gang-related incident. Many students already had a relationship with these horses through the equine program, Power Tools for Living, in place at the school for the previous four years. On that day, creating the opportunity for students to go out and be with the horses was a way to help with their grieving process and give them a safe place to take their pain instead of acting out. A 2013 review of research conducted on equine assisted therapies identified positive changes in anxiety, depression, inattention, social skills, self-esteem, emotional development/empathy and self-regulation for at-risk youth as well as children with suicidal ideation, ADHD, anxiety, history of sexual abuse and other social and behavioral problems. A recent study on effects on youth between 10-18 years of age with post-traumatic stress disorder (PTSD) conducted by Tuft University concluded that equine therapy is equally effective as traditional office-based therapeutic services in significantly reducing PTSD symptoms over a 10-week period. For some types of trauma where trusting another human being is an enormous issue, such as sexual abuse, equine therapy may have an advantage over work with a therapist. A 2013 study out of Queensland University, Australia, showed significant reduction in depression for patients who had experienced childhood sexual abuse following equine facilitated therapies. Horses' unique temperament makes them the ideal companions in help people reconnect and rebuild self-esteem in face of trauma or other difficulties in life. As herd animals, they possess a keen ability to read nonverbal cues as their survival depends on determining whether a person is a threat. "With a horse you have to keep your emotions in check," Dyer said. "If you are aggressive, a horse will shut down or worse, retaliate. And if you are shut down emotionally, they will just walk all over you." Horses demand undivided attention and consistency, perceiving in an instant if one is distracted and not completely present or giving mixed messages. They can tell if your intentions are clear, whether there is determination or not, which gives people working with horses the opportunity to practice being direct, focused and present, writes Ana Isabel Ricalde de Jager in Mundo Equino magazine. With children who have lived through crisis, it often helps them let their guard down and begin to talk about their troubles and feelings. In her article, Ricalde de Jager relates how in the TAAC-Casa Alianza Mexico equine therapy program for children who have suffered abuse, one of the boys suddenly started talking about how his father drinking would make him change from being calm to out of control when he saw a horse do something he perceived as similar. Simply being in the presence of horses is a powerful experience for most people. The significance of this experience is of even greater magnitude for young people facing difficult challenges.